To include a description of when bats have young, what kind of places they roost in in summer when they have their babies, how they feed their babies and when the young become independent, what they do in winter. This can be drawn from information ‘A year in a bat’s life’ and would include information on hibernation versus the active season for bats. Study of bat habitats – what bats need to live in Ireland. Questions this project would address are what kinds of places they use for roosting in summer and in winter and where they find their food. How do humans affect bat habitats? What can we do to help protect bat habitats? This could tie in with school gardening and landscaping projects. Developing tree lines and hedgerows will benefit bats, as will creating a school pond or putting up bat boxes around the school. We touch on the subject of ‘ecosystem services’ on this website. Some bat species, mainly in the tropics, are responsible for pollinating and dispersing seed of a number of human crop plants. In Ireland, the ecosystem services bats provide are indirect – they eat insects that might otherwise eat our crop plants or might bite us. 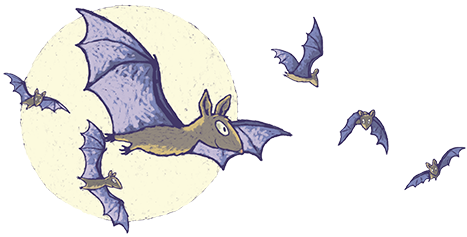 Ask your students to look at this website and to carry out an online search for food and crop plants that would not be available to humans if it weren’t for bats being involved in their lifecycle.